Today's post makes 500 posts here at the ol' blog. What do I win? Not exactly true that. I've gotten a lot of hobby motivation through the blog and made contact with a lot of great folks both here and on their own sites. I'm glad I do it, and look forward to continuing with it and hope you'll continue down the road with me. 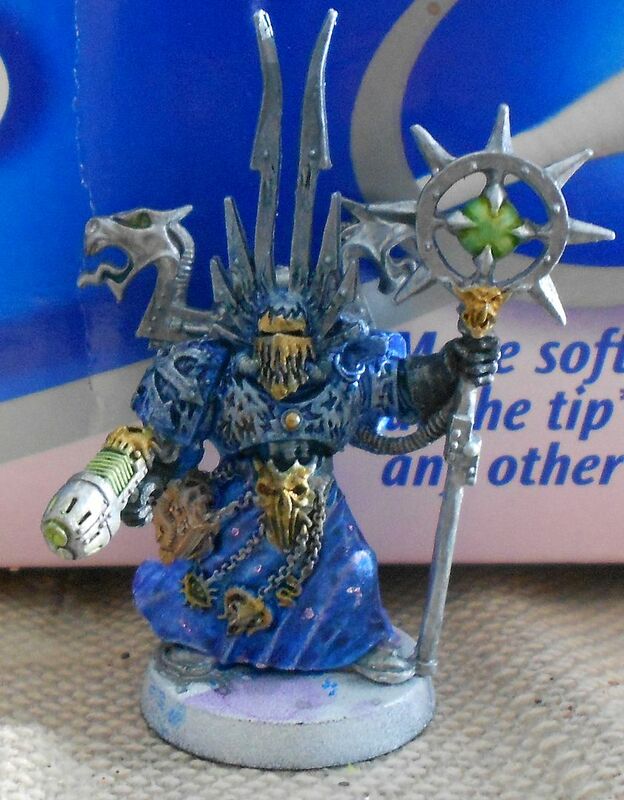 Here's a WIP Chaos Space Marine sorcerer for the Endless Ones. This fine fellow is one of the first 40K models I bought when I was getting back into 40K over a decade ago, but has never been painted. Well, to be honest I have more than one now so I'm not sure that this is the exact one, but it's the same sculpt! Through three prior CSM codices I never got around to using sorcerers, but hopefully now they'll start to see some use. Here's a group shot of the painted Endless Ones so far, with some Word Bearer terminators thrown in to get the lot up to 1500pts. I took them out to the local store for an attempt at a test drive but the locals were mostly still recovering from a tournament so they came home unblooded. Another time! 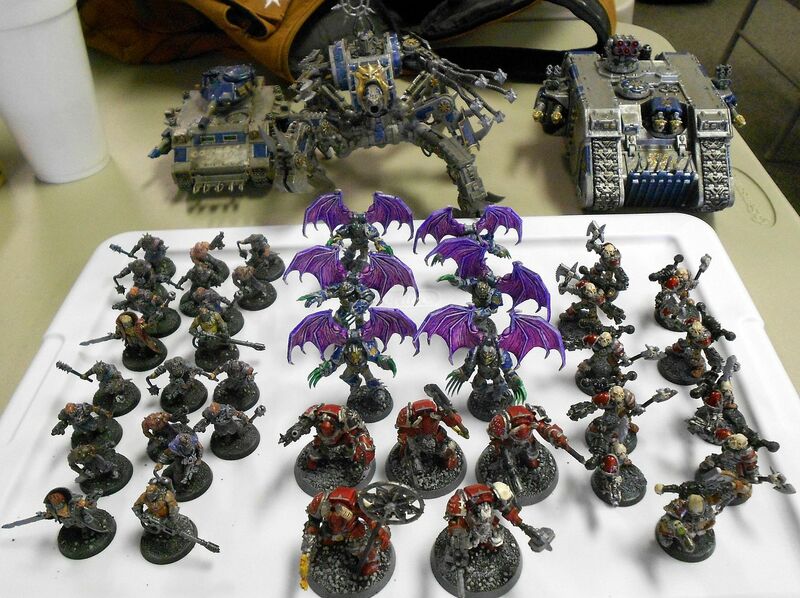 "Kharn" + berzerkers in Land Raider, terminators, warp talons, 2xcultists, defiler, predator. Once I get the sorcerer and two squads of regular CSM I'm working on done I will probably put the Endless Ones in neutral for a little while to work on various side projects like the Ork Dakkajet, some Fantasy Chaos and various Reaper figures. Maybe I'll have some of the Reaper metal backlog cleared out before the pile of Kickstarter Bones floods in a few months from now! My next league game is against the store owners Tyranids, so look for some guard on bug action sometime later this week! Congrats on the pentuple century! I always enjoy reading your blog, looking forward to seeing more of the Endless Ones! The real story is that The Hooters have a greatest hits! @Mordian7th - Thankyew! There's more coming! @Powerposey - It's a European import. They do have some good stuff, though obviously greatest hits is a relative term. 500!? Wow, impressive stuff, but at least it's all been good reading sir. Congrats!